Narrow your search results also by using subjects, e.g. To broaden the search you can use Search by Collection in alphabetical order, e.g. To search by Digital Content and Creators also require entering a probable subject, e.g. This is a last letter of Veronika (Vera) Somogyi from a Hungarian – Austrian border village of Hegyeshalom. It was a force march of Hungarian – Jewish women from Budapest to forced labor in Austria. The last stop was in a Hungarian border village of Hegyeshalom. The Red Cross let them a chance to write postcards to their families. It was her last letter. She was never heard of ever since. Her three-years-old daughter Gabika, who remained in Budapest, survived. Nowadays Gabriella (Gabika) Rosenfeld lives in Los Angeles. Recently she brought to the Museum the last letter of her mother. Here it is. 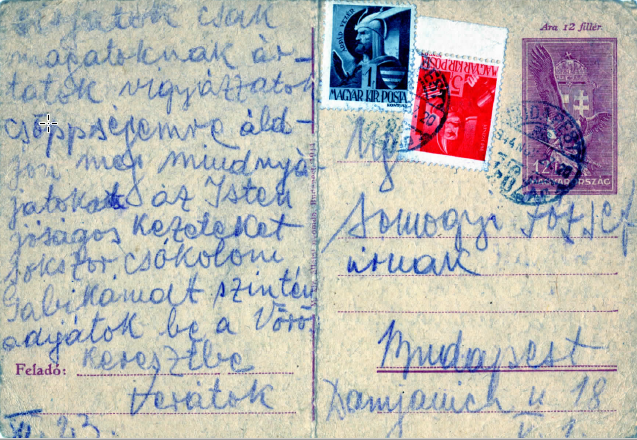 This postcard was written on 23 November 1944. It arrived to Jozsef, Vera’s father in Budapest, on November 27, 1944. I am writing from the Hegyeshalom on the Austrian border. Tomorrow we are crossing the border. I have lost track of Gyula. Do not cry dear Mother, take care of yourself, if l return I want to see you. I think that Jozsa, Agnes and Sandor also were taken. How is my Gabika? Where is she, if I could only know. If only Gyula could get back, to be near her and you. I do not think I will come back. My dear Parents, take care of yourselves, do not cry, you are only hurting yourselves. Take care of my baby, may God have mercy on us all. I kiss your blessed hands. Please place my Gabika with the Red Cross. Page Generated in: 0.05 seconds (using 39 queries).